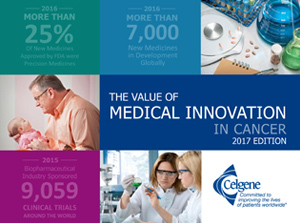 Innovation leads to the discovery and development of therapies that save and extend lives — the primary goal of any healthcare program. And by doing that, innovation helps keep healthcare costs down and drives economic growth. Thanks to medical innovation patients are living longer, healthier, more productive lives, a benefit that extends across the entire healthcare ecosystem to society as a whole. Simply put, the longer one lives, the more time they have to be productive and contribute to their families and society. Multiple sclerosis is a complex disease. 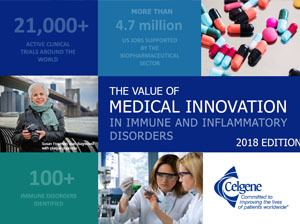 The toll on patients, society and the healthcare system is substantial, but innovative therapies can hold promise and opportunity to address these unmet needs, potentially delivering new benefits for patients. The cycle of medical innovation produces lasting improvements in healthcare and the global economy. In our lifetime, medical innovation can simultaneously produce a world free from cancer as we know it today and spur global economic prosperity. The cycle of medical innovation can continue to provide relief for patients with chronic immune disorders, an important area of unmet need. Health is a value in itself and a prerequisite to economic growth. 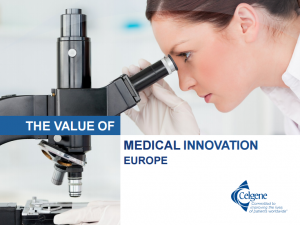 Investing in medical innovation in Europe contributes to better health, economic prosperity and social cohesion. Creating disease-altering therapies requires long-term investment, innovation and access. The pricing of innovative medicines is complex, with many factors that determine the benefits to patients. Helping patients gain access to the treatments they need. Access and adherence to innovative medicines reduces overall costs of care. Medicines reduce long-term medical costs and bolster the overall economy.